"Oxen working the fields… the eternal river Ganges… jeweled elephants on parade. Today these symbols of ancient India exist side by side with a new sight — modern industry. …India needs the technical knowledge of the western world." In 1984 Union Carbide’s pesticide plant was responsible for the worst industrial accident in history. 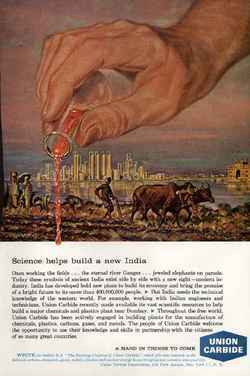 Union Carbide had frequently exported "untested technology" to the Indian plant, which was poorly run. It had imposed a huge cost-cutting program at the plant, causing safety measures to be scaled down (they were all malfunctioning or turned off at the time of the accident). No disaster planning was in place. The disaster immediately killed 3,000 peple, and 15,000 more died later from injuries. The estimated number of people injured range from 150,000 to 600,000; 20 years later, people are dying from contamination in soil and water that has still not been cleaned up. "…In 1994, Union Carbide sold its half interest in UCIL to MacLeod Russell (India) Limited of Calcutta, and UCIL was renamed Eveready Industries India, Limited. …As a result of the sale of their shares in UCIL, Union Carbide retained no interest in — or liability for — the Bhopal site"
"Union Carbide negotiated a settlement with the Indian Government in 1989 for $470 million US, a total of $370 to $533 per victim, a paltry sum that is too small to pay for most medical bills." "While we welcome the announcement that the Indian government wants to take proactive and urgent measures to conduct the clean-up, Greenpeace believes that after twenty years this is the slowest first step in history. The group has also called for US firm Dow Chemicals to be made responsible for financing the clean-up." 2) Kids in the sandbox are taught that if they make a mess, they’re responsible for cleaning it up. How did the grown-ups who run global businesses escape this basic tenet of the human race? …many individuals within Dow would like the corporation to admit its responsibility, so that the public can then decide on the best course of action, as is appropriate in any democracy. "Unfortunately, we have responsibilities to our shareholders and our industry colleagues that make action on Bhopal impossible. …Dow does not and cannot acknowledge responsibility. If we did, not only would we be required to expend many billions of dollars on cleanup and compensation–much worse, the public could then point to Dow as a precedent in other big cases. …For now, this means acknowledging that much as it pains us, our prime responsibilities are to the people who own Dow shares, and to the industry as a whole. We simply cannot do anything at this moment for the people of Bhopal." Check out another of the YES Men’s handiwork — a mock Website that, while devastatingly effective, unfortunately snared the venerable BBC: "Dow Falls Victim to Elaborate, Sophisticated, Idiotic Hoax". Reading all this makes realize that, 20 years later, few lessons have been learned about introducing new technologies into the environment in the name of "improving the human condition". One of today’s many looming Bhopal disasters is probably genetically modified foods; rather than focusing on environmental health as a guiding principle, the prime concern is shareholder profit, pure and simple. A nice fat share price may improve someone’s "human condition", but when the time comes to deal with the consequences, it sure won’t be yours or mine.